I really believe in the power of belief, which is the ethos that whatever you think of, you can bring about. That’s going to sound silly, but I was chilling in my room this afternoon and I was thinking about how much I wanted to eat a burger and how it’s been a while with this entire food conscious attitude in summer, when I receive my invitation from Roadster, the Lebanese all time favorite and most popular fast food restaurant chain, to try out their new black-wheat bun burger, aka The Black Burger. 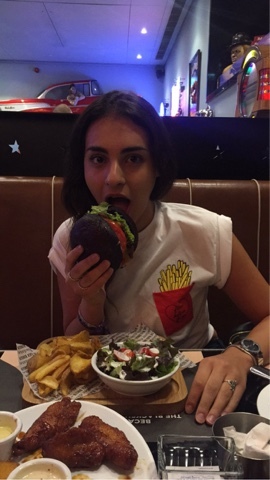 I was so happy I accepted this “coincidence” as a sign from God, I imagined he said to me, “Thou shalt eateth this berger tonight”—or maybe that was Shakespeare. I called my friend whom I was planning to have coffee with later today to say my good-bye before he travels abroad, and I told him, “Change of plans, we’re having dinner. 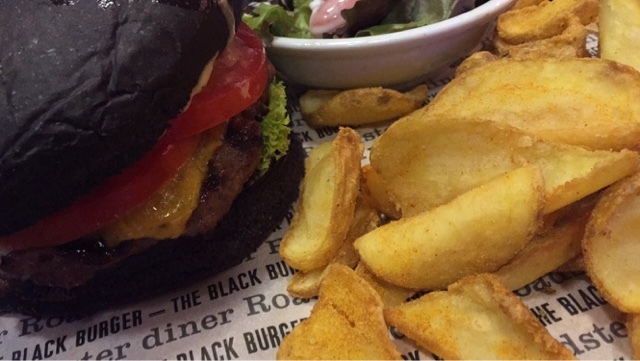 Youth shouldst not leaveth Lebanon before trying the black berger”. He definitely agreed. 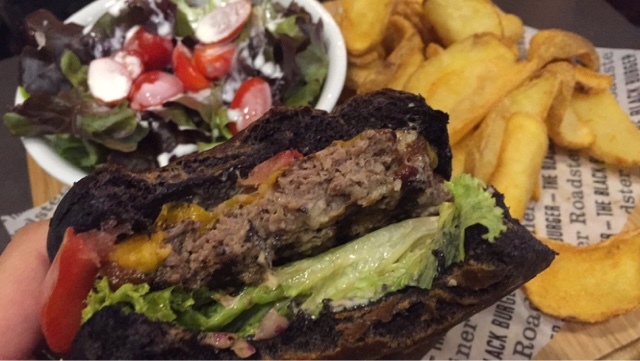 The black burger was already on my Instagram feed and people were talking about it. Yet, I had no clue if people were positive about it. I grabbed my burger—and before I could take a bite, I took a picture of course and I Instagramed it—and bit in the softest hamburger bun ever. My friend said, “It’s soft like a muffin”, well I’m not sure how soft a muffin is but the burger bun was definitely a brioche cloud, not sweet though just plain. Thisclassic burger (meat patty, lettuce, tomatoes, cheddar cheese, and some pickles I omitted) was served with curved tsipper fries and your choice of a cherry tomato or Caesar salad. 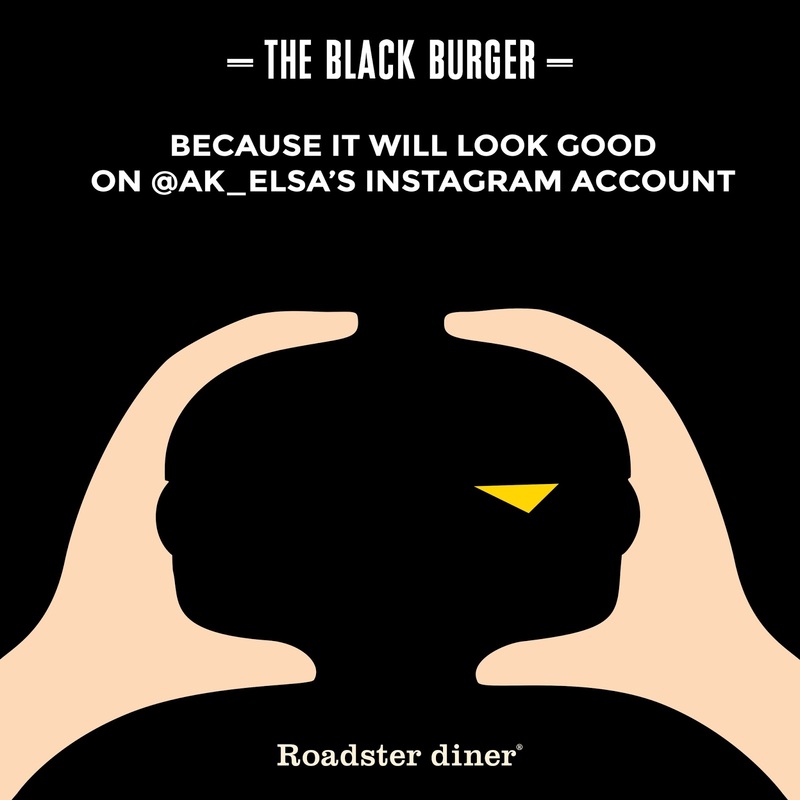 I really loved the black bun and I started imagining it with all kinds of burgers; I would totally pull off a BBQ sauce bacon black burger—hmmm I can already feel the taste of it in my mouth. Besides the hype about this particular bread, everything was almost on point. “Almost” because I thought that the steak sauce and the juicy steak wet the bun too much. But I don’t mean to change the sauce at all, I actually preferred it over the thicker and richer mayo-based alternatives.